Greetings! 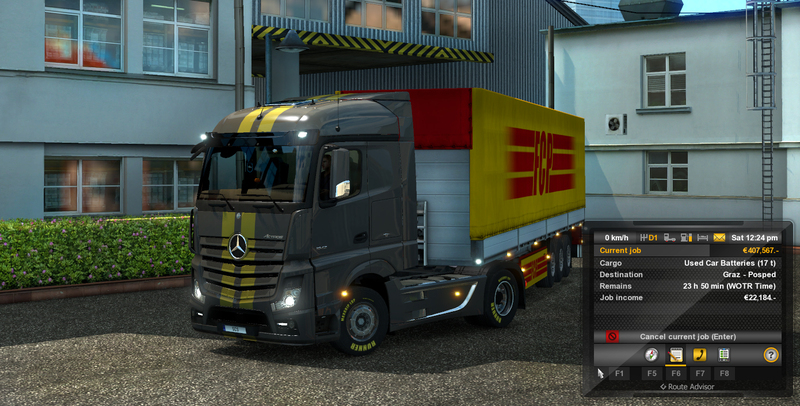 Today we'd like to cover a design-oriented topic relevant for the upcoming Euro Truck Simulator 2 Update 1.22. After quite a few rounds of private beta tests and fixes, we are getting close to releasing the first Open Beta of the update to Steam. 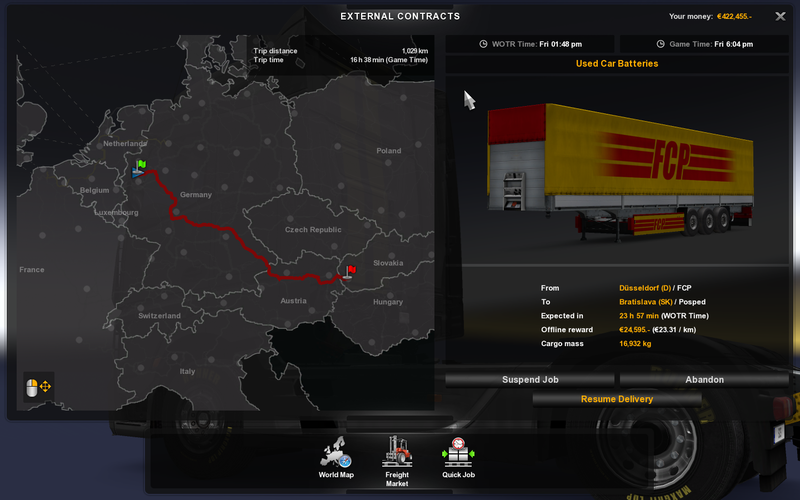 Along with the release of the Beta, we will roll out the Contracts feature on World of Trucks (as already covered earlier on our blog). Once you'll run the new version of the game, you will see that we have been through a slight modification of the main user interface "desktop" screen. We have redesigned the job info widget - the element on top of the screen showing you information about your current assignment. 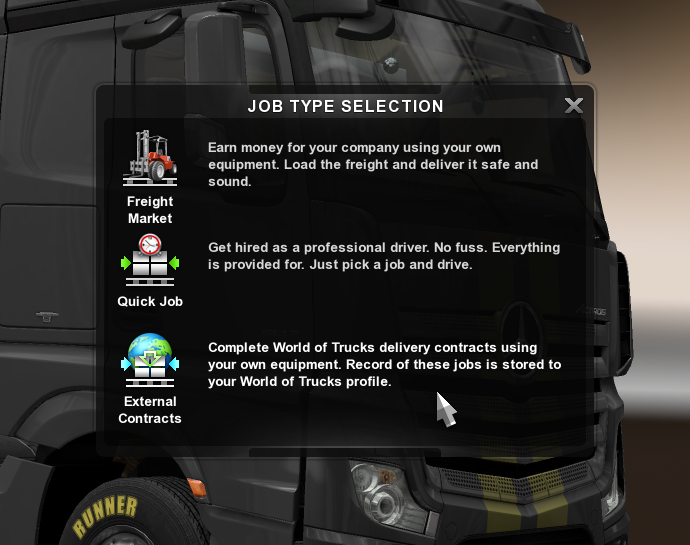 With the addition of World of Trucks Contracts, we now need to provide the player with enough information on the jobs received this way as well as on the regular Freight Market or Quick Jobs supplied by the standard game economy. In fact, the player can be assigned both type of jobs in parallel. The new Contracts are actually happening "online" - the game communicates with the back-end servers frequently to update the system on each player's vehicle position and situation. Network connections though can be shaky, and the player should also be able to take a break from a delivery easily taking two-hours in real time, so we need an ability to interrupt a Contract (save the player's progress) and resume it later. But the next day, the player may be offline, or just decide to go for a quick normal delivery before resuming the Contract job. So in principle we need to make sure that there can be two concurrent job assignments. With Contracts (and the fact that they are the first step towards more complex features), we have also faced a new game design challenge - the concept of time in the game. As of now, you were used to the accelerated Game Time (sometimes shortened in the game as G.T.). It's the clock used for the standard-game day cycle, accelerated so that 24 game-time hours take approximately 72 real minutes. We are not going to change the flow of time in regular game, but for Contracts, we are going to introduce a new clock - World of Trucks Time (you may see it shortened in the game as "WOTR Time", or "W.T." World of Trucks Time is based on Coordinated Universal Time, a real-world "clock" where 24 hours takes no less then real 24 hours to complete. We use it to synchronize all World of Trucks features - jobs, future economy and player interactions, and upcoming online activities. It is what the servers use internally, but we have decided to also make it visible for the players, so that they can understand what the delivery deadlines are etc. 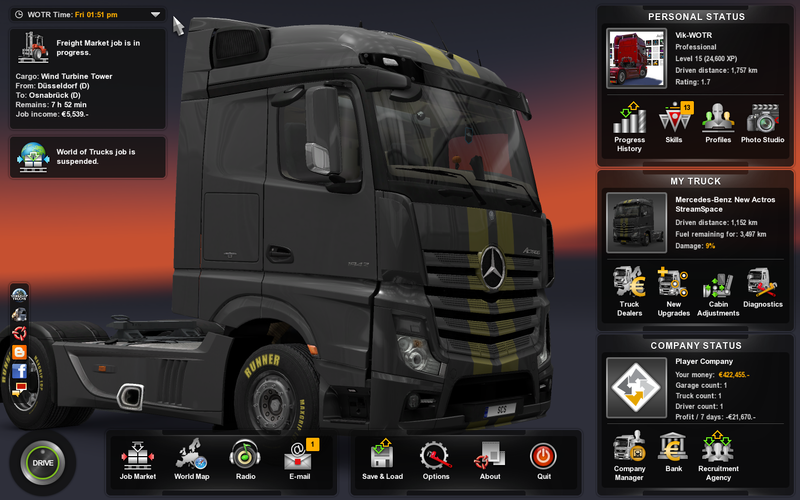 So you will encounter World of Trucks Time immediately when taking your first World of Trucks Contract. All World of Trucks jobs will be based only WOTR Time limit to complete. Right now during the beta, while we are stress-testing our server infrastructure and sorting out potential bugs, the WOTR Time for job completion will be fixed to only several hours for any job. Once we feel the servers are working as intended even under load, we will further increase the precision of tracking and also have Contracts with a wider range of time limits for enhanced gameplay experience.